Is Crystal Pepsi Making a Comeback? Crystal Pepsi, the long-lost elixir that tastes like sweet '90s nostalgia (oh, and Pepsi), might be making a comeback thanks to diehard fans who've urged Pepsi to remake the caffeine-free cult-favorite. And unlike Flavor Flav and Birkenstocks, this is a '90s comeback we can actually get behind. 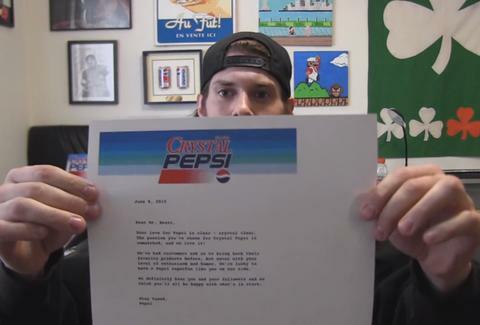 After rallying tens of thousands of clear cola fans on Twitter and a Change.org petition, Kevin Strahle, a professional eater and founder of the #BringBackCrystalPEPSI campaign, received a letter from Pepsi on Monday, commending him for his "crystal clear" love and passion for Crystal Pepsi and saying he should "stay tuned," according to a report by the New York Daily News. "We definitely hear you and all your followers and we think you'll all be happy with what's in store," the letter read, which hopefully means we can expect the soda's triumphant return like that of Surge, another canned relic of the decade. Strahle announced the letter and celebrated the victory in a YouTube video, saying, "I have chills doing down my spine right now." Thrillist reached out to PepsiCo to see if they could tell us more. Tony Merevick is Cities News Editor at Thrillist and doesn't remember Crystal Pepsi from his '90s childhood days -- probably because he was too busy blowing bubbles in his chocolate milk. Send news tips to news@thrillist.com and follow him on Twitter @tonymerevick.